The worst offender is the Allahabad Mandal, where around 23 blocks are over-exploiting groundwater. 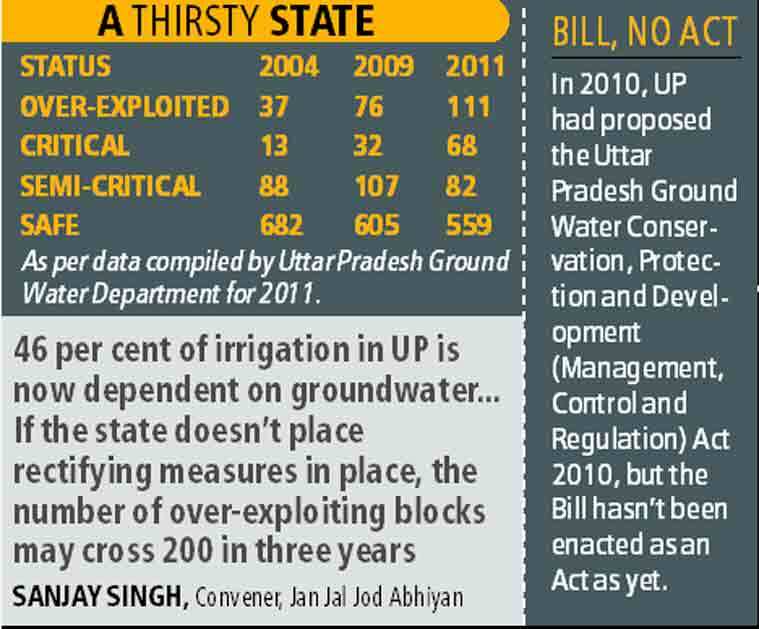 Forty six per cent of irrigation in UP is dependant on groundwater. Indiscriminate extraction of groundwater is continuing unabated in Uttar Pradesh with the number of blocks over-exploiting the natural resource registering three-fold hike in seven years. Number of such blocks is now pegged at 111, as per the latest data compiled by the Uttar Pradesh Ground Water Department for 2011. The groundwater data is compiled by the department every two years and analysed, before being released. As per the department, blocks “over-exploiting” groundwater has seen a steady rise, from 37 in 2004 to 76 in 2009 to 111 blocks in 2011. Similarly, the number of “critical blocks” has risen from 32 in 2009 to 68 in 2011 though the number of “semi-critical blocks” has come down from 107 to 82. The number of “safe blocks” has also gone down from 605 to 559. “As other sources decline, the dependence on groundwater is constantly increasing,” said P R Chaurasia, director of the UP Ground Water Department. “Even rainfall has been playing truant and doesn’t account for much of groundwater recharge,” Chaurasia said. As per the report, the worst offender is the Allahabad Mandal, where as many as 23 blocks are over-exploiting the groundwater. Of of these, 11 are in Pratapgarh district alone. Next is Agra Mandal with 19 blocks, 10 of them in Agra district. Water conservationist Rajendra Singh, better known as ‘Waterman of India’, termed the trend in UP as “dangerous.” “UP is a crucial state and if we have a crisis here, it will impact the entire nation,” Singh said. He said to reduce dependence on groundwater, the state’s farmers should subtly adjust their crop cycle to rainfall. “They should also increasingly employ drip irrigation and sprinklers,” he said. In the past, Singh has pushed for Groundwater Control Act and River Rejuvenation Policy in UP, both of which are yet to become a reality. In 2010, UP had proposed the Uttar Pradesh Ground Water Conservation, Protection and Development (Management, Control and Regulation) Act 2010, but the Bill hasn’t been enacted as an Act as yet.